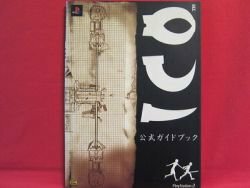 Title :ICO official strategy guide book / Playstation 2, PS2 Language : Japanese. This is an official book. Release Date : 2001 Total Pages : 94 pages Platform: Playstation 2, PS2 Condition : USED. Very Good. No missing page. Description:This is a Japanese Videogame "ICO" Strategy Guide Book. 'Host Knukle' Japanese Red light district guide book for Women. How to Draw Manga (Anime) Book ""IC Screen Technical Gallery #2""